MTS-SV1-DN8TC Sampling valve sanitizable DN8 TC is an extension equipment to the product sample taking during the fermantation-maturation process in the tank. Connection : Side connection (to tank SV port TriClamp) DIN 32676 “Tri Clamp” ⌀34 mm DN 8 / NW 8. The sampling valve is equipped with the hole for easy sanitizing . 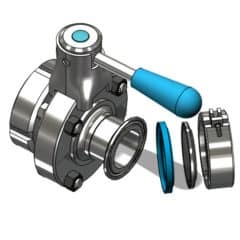 MTS-DO1-DN25TD Bottom filling-draining pipe DN25TC/DN25DC without valve is am extension fitting for connecting the tank to the brewhouse using hoses, pumps, sanitation station, other tanks, bottle or keg fillers etc. Connections : Tank side – 1x DIN 32676 “Tri Clamp” ⌀50.5mm DN 25 / NW 25, Out side – threat throat 1x DIN 11851 “Dairy coupling” DN 25 / NW 25. 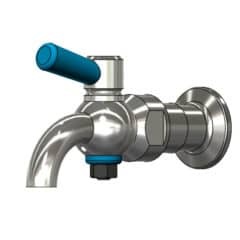 MTS-CS1-DN25TT Upper sanitizing pipe DN25TC/DN25TC without valve is an extension fitting for connecting the tank to the sanitizing equipment (CIP), filling level indicator, adjustable pressure valve, manometer etc. Connections 2x DIN 32676 “Tri Clamp” ⌀50.5mm DN 25 / NW 25. 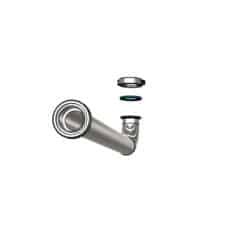 MTS-DO1-DN32TD Bottom filling-draining pipe DN32TC/DN32DC without valve is am extension fitting for connecting the tank to the brewhouse using hoses, pumps, sanitation station, other tanks, bottle or keg fillers etc. Connections : Tank side – 1x DIN 32676 “Tri Clamp” ⌀50.5mm DN 32 / NW 32, Out side – threat throat 1x DIN 11851 “Dairy coupling” DN 32 / NW 32. MTS-DO1-DN40TD Bottom filling-draining pipe DN40TC/DN40DC without valve is am extension fitting for connecting the tank to the brewhouse using hoses, pumps, sanitation station, other tanks, bottle or keg fillers etc. Connections : Tank side – 1x DIN 32676 “Tri Clamp” ⌀50.5mm DN 40 / NW 40, Out side – threat throat 1x DIN 11851 “Dairy coupling” DN 40 / NW 40. 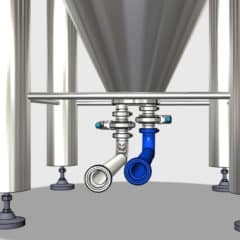 MTS-DO1-DN25TT Bottom filling-draining pipe DN25TC/DN25TC without valve is am extension fitting for connecting the tank to the brewhouse using hoses, pumps, sanitation station, other tanks, bottle or keg fillers etc. Connections 2x DIN 32676 “Tri Clamp” ⌀50.5mm DN 25 / NW 25. 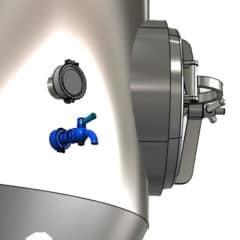 MTS-DO1-DN32TT Bottom filling-draining pipe DN32TC/DN32TC without valve is am extension fitting for connecting the tank to the brewhouse using hoses, pumps, sanitation station, other tanks, bottle or keg fillers etc. Connections 2x DIN 32676 “Tri Clamp” ⌀50.5mm DN 32 / NW 32. 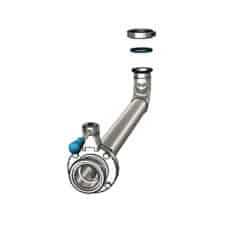 MTS-DO1-DN40TT Bottom filling-draining pipe DN40TC/DN40TC without valve is am extension fitting for connecting the tank to the brewhouse using hoses, pumps, sanitation station, other tanks, bottle or keg fillers etc. Connections 2x DIN 32676 “Tri Clamp” ⌀50.5mm DN 40 / NW 40. 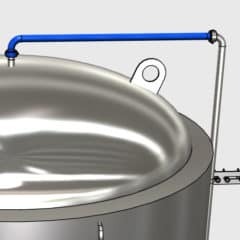 MTS-DO1-DN50TD Bottom filling-draining pipe DN50TC/DN50DC without valve is am extension fitting for connecting the tank to the brewhouse using hoses, pumps, sanitation station, other tanks, bottle or keg fillers etc. Connections : Tank side – 1x DIN 32676 “Tri Clamp” ⌀64mm DN 50 / NW 50, Out side – threat throat 1x DIN 11851 “Dairy coupling” DN 50 / NW 50. 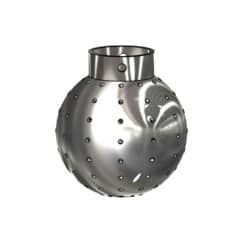 MTS-SB1-DN25F Cleaning spray ball 320°⌀65 DN28,5 for DN25 fixed is an extension equipment to cleaning and sanitizing inside of the tank. Connection : Split pin on tube DN28,5 (for pipe DN25). Fixed (non-rotating), effective angle 320°. 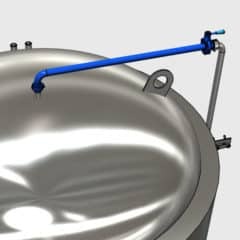 MTS-DO1-DN50TT Bottom filling-draining pipe DN50TC/DN50TC without valve is am extension fitting for connecting the tank to the brewhouse using hoses, pumps, sanitation station, other tanks, bottle or keg fillers etc. Connections 2x DIN 32676 “Tri Clamp” ⌀64mm DN 50 / NW 50. 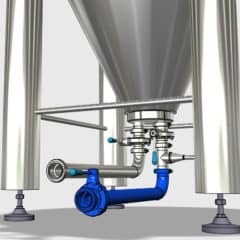 MTS-DO1-DN25TDV Bottom filling-draining pipe DN25TC/DN25DC with valve is am extension fitting for connecting the tank to the brewhouse using hoses, pumps, sanitation station, other tanks, bottle or keg fillers etc. Connections : Tank side – 1x DIN 32676 “Tri Clamp” ⌀50.5mm DN 25 / NW 25, Out side – threat throat 1x DIN 11851 “Dairy coupling” DN 25 / NW 25. 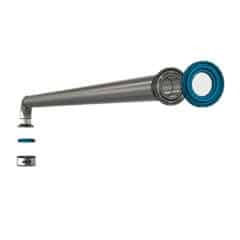 MTS-CS1-DN25TTV Upper sanitizing pipe DN25TC/DN25TC with valve is an extension fitting for connecting the tank to the sanitizing equipment (CIP), filling level indicator, adjustable pressure valve, manometer etc. Connections 2x DIN 32676 “Tri Clamp” ⌀50.5mm DN 25 / NW 25. 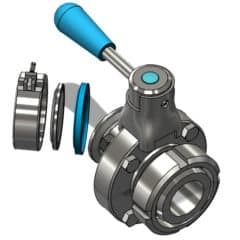 The pipe includes the butterfly valve for easy closing of the pipe. It is recommended if the level indicator will be sanitized or disconnected during the fermentation and maturation process in the tank. Disc (butterfly) valve with inlet DN25 (also NW25) DIN 11851 “Dairy Coupling” (cone+nut side) and outlet DN25 (also NW25) DIN 32676 “TriClamp”, with security locking device and sealing caps. For use with pressure tanks equipped with DIN 11851 “Dairy Coupling” DN25 throat-connection . Fully sanitable equipment designed for food production technologies. MTS-DO1-DN32TDV Bottom filling-draining pipe DN32TC/DN32DC with valve is am extension fitting for connecting the tank to the brewhouse using hoses, pumps, sanitation station, other tanks, bottle or keg fillers etc. Connections : Tank side – 1x DIN 32676 “Tri Clamp” ⌀50.5mm DN 32 / NW 32, Out side – threat throat 1x DIN 11851 “Dairy coupling” DN 32 / NW 32. Disc (butterfly) valve with inlet DN32 (also NW32) DIN 11851 “Dairy Coupling” (cone+nut side) and outlet DN32 (also NW32) DIN 32676 “TriClamp”, with security locking device and sealing caps. For use with pressure tanks equipped with DIN 11851 “Dairy Coupling” DN32 throat-connection . Fully sanitable equipment designed for food production technologies. MTS-DO1-DN40TDV Bottom filling-draining pipe DN40TC/DN40DC with valve is am extension fitting for connecting the tank to the brewhouse using hoses, pumps, sanitation station, other tanks, bottle or keg fillers etc. Connections : Tank side – 1x DIN 32676 “Tri Clamp” ⌀50.5mm DN 40 / NW 40, Out side – threat throat 1x DIN 11851 “Dairy coupling” DN 40 / NW 40. 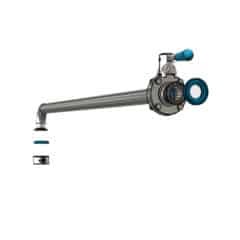 MTS-DO1-DN25TTV Bottom filling-draining pipe DN25TC/DN25TC with valve is am extension fitting for connecting the tank to the brewhouse using hoses, pumps, sanitation station, other tanks, bottle or keg fillers etc. Connections 2x DIN 32676 “Tri Clamp” ⌀50.5mm DN 25 / NW 25. Butterfly Valve DN 25 / NW25 is welded on the input/output side of the pipe.